This is one of my most treaured books; The Camera at War by Jorge Lewinski. 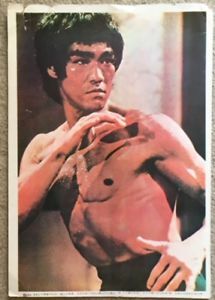 Published in 1978 it will, I assume be difficult to obtain but well worth the effort nonetheless. 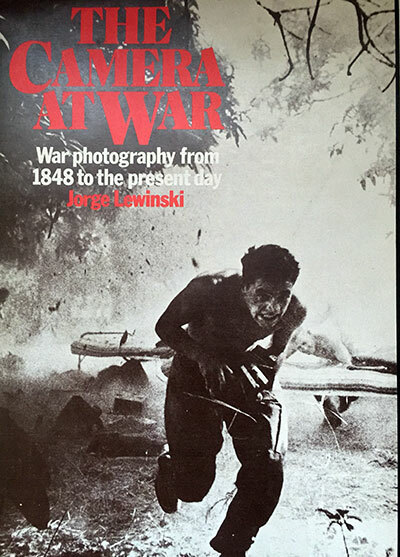 Covering conflict photography from 1848 to 1978 Lewinski pays tribute to the many photojournalists who risked, and lost their lives to report the reality of war. An established photographer himself he was born in Poland in 1921, suffered at the hands of Russian occupation and forced labour in Siberia before fighting for the Allies in the Middle East. Following his release he went on to join the RAF and remained in Britain after the war where he settled with his photographer wife, Mayotte Magnus. 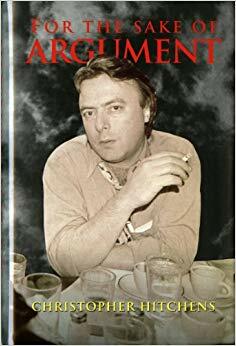 Perhaps then this would explain why he chose to publish this book which was a departure from his own personal photographic life. Lewinski was a portrait photographer of great repute with Francis Bacon, Lowry and David Hockney amongst his many subjects and his work remains on permanent display in both London and America after his death in 2008. Chapter one begins with the period from 1848 to 1912 with remarkable pictures from Crimea to General Grant’s council of war during the American Civil War where rebels can be seen hanging from gallows. Consider too a photograph of a dead rebel sniper at Gettysburg in 1863 and the logistics of taking that shot. Timothy H. O’ Sullivan not only endured the horror of the conflict and the difficulties that came with it but had to carry bulky equipment around which had to be housed on a tripod which in turn meant standing up on the front line. Lewinski takes us through the Afghan War in 1879 to the Spanish-American War of 1898 in which some two hundred reporters were sent to cover it such was the public interest in it. The Spanish Civil War saw the emergence of Robert Capa and quite possibly the most famous war photograph ever taken. Decades on the debate continues as to the legitimacy of the shot. The Second World War makes up the largest section of the book, we are shown frozen Russian bodies in Finland, Churchill chatting to civilians in a bomb shelter and Polish civilians hanging by their necks. There is a remarkable photograph of Gurkhas brandishing their kukri knives as they charge down a dessert slope in 1943. Men born and raised in the hills of Nepal fighting hand to hand in desert warfare. The chapter contains images of dead bodies, not individual ones as in previous pages but many of them. Some lay frozen in Russia as their relatives stoop over them in the worst possible identification parade, others, such as the Japanese who lay washed up on the shores of New Guinea and whose families would never get the chance to say goodbye. In contrast we see an Australian officer bound and blindfolded, knelt in the sand as a Japanese soldier raises his sword to behead him in 1945. This conflict also saw the rise to photojournalistic immortality of W. Eugene Smith whose images of the war in the Pacific are as hard hitting as any recorded before or since. Chapter four covers the Korean War to Northern Ireland and all of the conflicts which came between it other than Vietnam, we are given a taste of things to come via the Korean conflict of 1950 to 1953. Here, in equal measure are images of shattered G.I.’s freezing cold in winter and sweat soaked and rain sodden in summer. Photographer Bert Hardy amongst others captured the plight of Korean civilians fleeing the combat zones with nothing more than the clothes they wore. We are also introduced to the imagery of a young English photographer called Don McCullin who would become Britain’s best known combat photojournalist and not without reason. 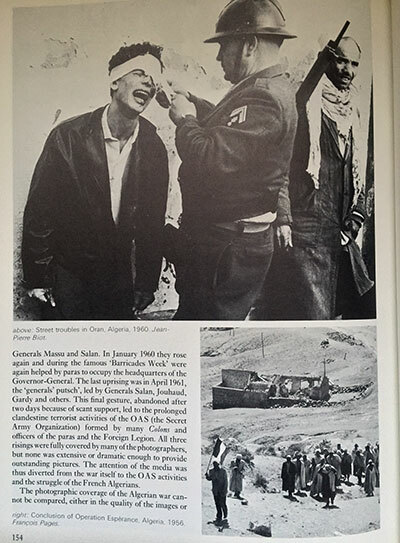 His photographs of the war in Cyprus helped give The Observer newspaper in London a lead on its rivals for journalistic integrity. McCullin was and remains a man of principle and pride in his work. His depiction of the street fighting and suffering families earned him a ten page feature in Paris Match and subsequent press awards. We are also shown the first images of fighting in the Middle East and Africa. The images of religious bigotry and sheer hatred run deep throughout the second half of the book but it was McCullin who travelled to Africa to cover the conflicts Nigeria and Biafra who showed tribal conflict in the most horrendous of ways. His image of a Biafran army captain stooped over one of his own dead soldiers lecturing him on why he had died is hard to get past. It shows the senselessness of it all, the anger and desperation of a young captain who dare not grieve for the young man on the ground. Once again you stare at the picture but must remind yourself of the courage of the man who stood there and took it. Vietnam has, unsurprisingly a chapter all to itself. 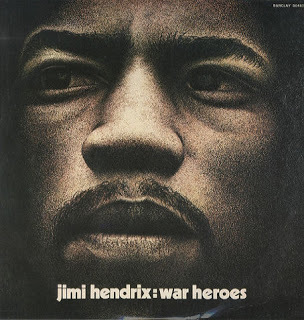 A long, bloody and foolhardy war which resulted in thousands of dead and injured and a final, slow dying humiliation for the American government also saw photojournalism reach new heights in hard hitting documentaries and magazine features. 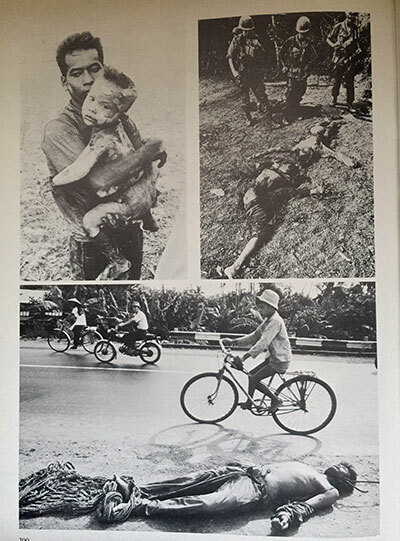 We see below left Horst Faas photograph of a Vietnamese child covered in napalm burns being cradled by his father in 1967 whilst Philip Jones Griffiths captures American soldiers placing divisional insignia medals in the mouths of the victims. 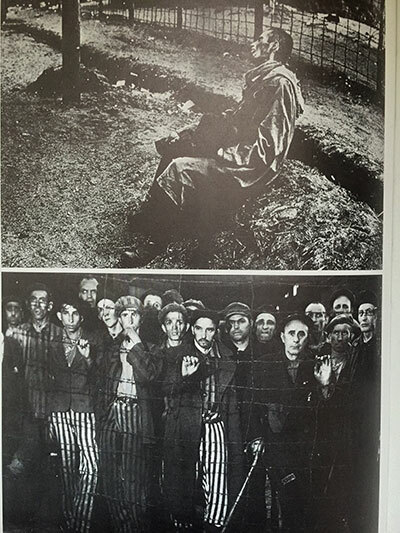 Below that we see the sickening reality of the indifference to the dead which became embodied in the Vietnamese by the time this was taken by Abbas in 1973. Finally there is a sympathetic but nonetheless dreadful tribute to those who suffered through no choice; the civillians, women and children. Not, as one would expect a chapter for the faint hearted but an important reflection and reminder of the effects of war on our lives and the land we live on. Below is a classic shot by Catherine Leroy of an American soldier looking for the sniper who has just shot and killed his comrade. Here lies another young man whose family would have waited for the base commanding officer to present his dog tags to them in the final, tragic episode of their part in a war zone previously unknown to them. 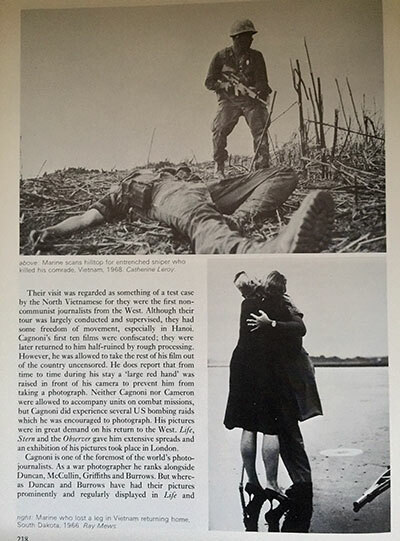 Beneath that we see Ray Mews’ heart breaking image of a Marine returning home to his girl in South Dakota in 1966, minus a leg and any chance of a resumption of a normal life thereafter.